BROOKLYN, New York, Wednesday, October 24, 2018 – The National American Italian Foundation (NAIF), in collaboration with the Sbarro Health Research Organization (SHRO), presented its Young Investigator Award to Assistant Professor Giuseppe Loianno, head of the NYU Tandon School of Engineering's new Agile Robotics and Perception Lab. 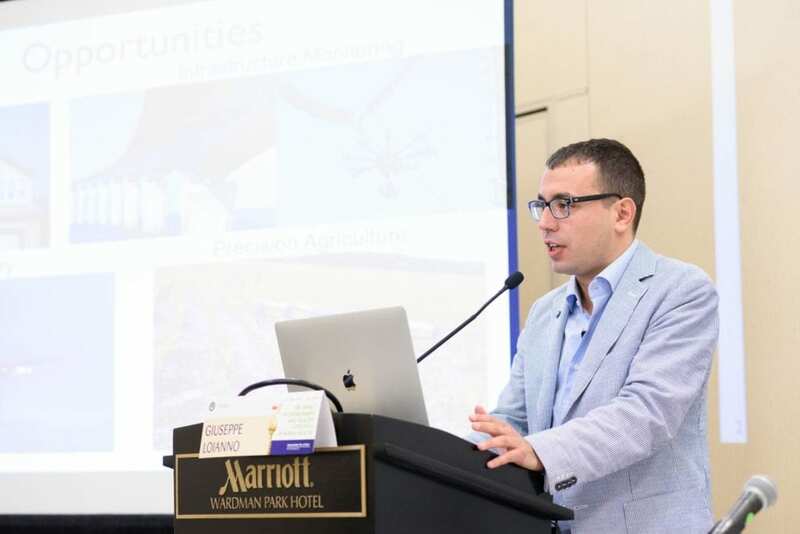 The award was bestowed at a conference focused on technology to advance human health and the health of the planet; there, Loianno gave a presentation entitled, "Drones for Health: Agricultural and Infrastructure Monitoring." Loianno, who is developing increasingly smaller and more autonomous drones by employing artificial intelligence and classic robotics, outlined the benefit of drones for inspection and monitoring of critical sites and infrastructure. Autonomous flying robots – otherwise known as drones – are being widely used to inspect disaster sites and areas needing environmental remediation, he told the audience. Among his current projects is one sponsored by the Tokyo Electric Power Company, which employs drones to examine conditions deep in the Fukushima power plant in Japan. He also pointed to their potential in decommissioning nuclear sites. "By the same token, they are being deployed in the agricultural sector," Loianno said. "Farmers can, for example, efficiently see which crops need irrigation or pest control, and drones can also convey information about which crops are ripe enough to harvest. Many people base their image of farming on old movies or books and think of it in picturesque terms, but in reality, farmers have become savvy users of technology." Loianno was appointed to NYU Tandon's Department of Electrical and Computer Engineering and Department of Mechanical and Aerospace Engineering in September. "We are pleased that Giuseppe Loianno has joined our faculty and feel confident that he will contribute to making NYU Tandon a hub of exciting research on autonomous robotics," said Dean Jelena Kovačevi?. "We are proud that the National American Italian Foundation has recognized his work and his enormous potential to address pressing environmental concerns with drone technology." NAIF is a non-profit, non-partisan organization dedicated to preserving, promoting, and protecting Italian-American heritage and culture and celebrating the accomplishments of those of Italian descent, like Loianno, who was born in Naples and educated at the University of Naples (Università degli Studi di Napoli Federico II), the world's oldest public non-sectarian university. NAIF awarded the honor on October 13, 2018 in Washington, D.C.